Solar ovens work! But, they heat up slowly. This is a great summer camp activity, and a good one to set up early in the day, then check over a period of time. These ovens also work best when it is sunny and warm, so wait for a nice, sunny day. Some afterschool programs have had great success with breaking this activity in to two sessions – the first, building and testing the ovens, and the second, using the ovens to cook s’mores, cookies, and more. It might also help for you to create an example oven ahead of time for students to refer to. Ask your students if they have ever sat outside on a sunny day. What did they notice about how the sunlight felt on their skin? If they stayed in the sun for a long time, did they get warmer, cooler, or stay the same? The Sun produces a lot of energy, and that energy heats the Earth, feeds plants and trees, drives our weather, and more. If you can, show them NASA images of the Sun, like these: http://solarsystem.nasa.gov/planets/sun/galleries. If we use the right materials, we can absorb and trap some of that energy found in sunlight, and even use it to accomplish something…like maybe cooking up some snacks! Harness the power of the Sun in the name of snack time! On the top flap of the pizza box draw a square with its edges 1″ from the four sides of the box. Teachers should do this next step: carefully use a box cutter/utility knife to cut a square flap in the lid of the pizza box, following the lines each team drew in step 1, but only cut three of the square’s four sides. Cut along the front and two sides of the square, leaving the back line intact. Fold the resulting flap so that it points up (see the image in step 4). Cover the underside of this flap with aluminum foil so that when the flap is pointing up, the foil is facing you (when the flap is closed, the foil should be inside the box). This foil will serve as your reflector. Be careful to make as few wrinkles as possible in the foil, and smooth out whatever wrinkles occur. Cut sheets of plastic wrap large enough to cover the square opening (let’s call this the “window”) in the top of the pizza box left behind when the flap is pointing up (about an inch of plastic wrap should overlap the sides of the open square hole). Tape a double layer of plastic wrap covering that opening to create an airtight window (you can tape the plastic wrap on the underside of the window, or on top of the window, as long as it is air tight) – sunlight will enter into the box through this window, warming the air inside, and you want to keep the air in there warm. Tape each side of plastic wrap down securely, trying to create a seal to keep as much air in the box as possible. Line the inside bottom of the box with black construction paper. Place the thermometer in the box so you can see the dial through the plastic window. See Figure 1 in Resources, above, for a diagram. Your oven is now ready to try out! Take it outside to a sunny spot and adjust the flap until the most sunlight possible is reflecting off the aluminum foil and onto the plastic-covered window. Use a stick or a dowel to prop the flap at the right angle. This may take a few tries. Your solar oven will reach about 90 C, 200 F. on a sunny day, and will take longer to heat things than a conventional oven, but can cook just as well. It is worth first testing the ovens and having children observe the changes inside over time – this is a great science experiment. If you want to get right to cooking your s’mores, you can skip to the “Make it Better” step of the activity, but if you have the time to first observe the ovens, there is a lot of good learning in there. After they first set up their ovens, have the whole group come together and predict what will happen. Do they think their ovens will heat up? Was it tricky trying to get the angle of the aluminum foil flap just right? How hot do they predict their ovens will get? How long will they take to heat up to their hottest point? What are some other contraptions that use the Sun’s energy, like these ovens, and how might they be similar to the ovens? Some examples could include greenhouses (the plastic window in the pizza box oven is like the glass of a greenhouse, trapping (infrared) energy inside the pizza box); and solar panels, which are often seen on rooftops or on Satellites. Like the pizza box, these usually have a dark (blue) background that absorbs a lot of light, and of course you have to point them towards the sun to make them effective. Have teams check the temperature in the ovens every 10 minutes, and record those temperatures. After each of these 10-minute observations, teams should share their thermometer readings and any observations with the other teams. What is happening inside the ovens? Do some ovens have different readings? What might contribute to those different temperatures (location, flap angle, tightness of the plastic wrap seal, etc.)? When you reach the point that the ovens have the same (or close to it) temperature after two readings, it is time to get cooking! A note: In some trials using a solar oven that was made based on this design, at 85 to 90 degrees F on a sunny afternoon it took about 30 to 35 minutes for the marshmallow to get warm enough to become soft and melt some of the chocolate to make a tasty, solar-powered treat. 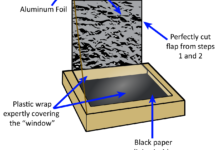 In ideal conditions this solar oven can easily heat up to about 160 to 200 degrees F. Using full, direct sunlight is important for heating this solar oven. MAKE SURE OVENS ARE FACING THE SUN! Believe it or not, sometimes teams might forget this important factor. Make a s’more by placing a marshmallow and a small square of chocolate on a graham cracker. Top with a second graham cracker. Careful transporting this set up – s’mores can be precarious, and the pizza boxes are shallow! You can omit the top graham cracker, if you’d like. Place your entire s’more in the oven – this should be done both quickly (so the hot air doesn’t escape), and carefully (so the s’mores don’t topple over and make big piles of goo). Have each team record the time they placed their s’mores in their ovens. You can fit several s’mores in the oven at a time. Place each one on a separate black paper square. Use a piece of tape and a pen to mark the paper with the student’s name and the time they start cooking. Monitor the s’mores, cooking them until the marshmallow and chocolate are melted. Record the time that they come out of the ovens. How long did it take? Eat the s’more’s (probably didn’t have to tell you that). Questions to consider together while the s’mores are cooking: How did the black paper help things in oven cook? What does the foil do? Does it help to keep the box closed? Why? Taking it even further: This is a great activity to repeat (particularly for the kids if you make more s’mores…), with some changes that will extend the learning. Have children redesign their ovens. What will they change? Does more foil make a difference? What if they place the box in a different location? 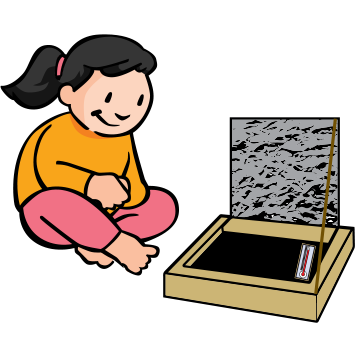 What if each team tried a different color of paper inside the box – white, red, blue, green, black, etc.? What else can you cook? Be systematic about the changes you test – if you change the oven design, teams should change one thing at a time. The characteristics of the ovens that can be changed – location, amount of foil, color of the paper, size of the oven, amount of plastic wrap, etc. – are all known as variables. When conducting an experiment, you should only change one variable at a time, so that you know what change contributed to any different results. If you change two things at once (such as paper color and location), you can never be sure which one made the oven heat up differently. Solar ovens use solar energy—light and heat emitted from the sun—to cook food. Solar ovens work because they are designed to absorb more heat than they release. 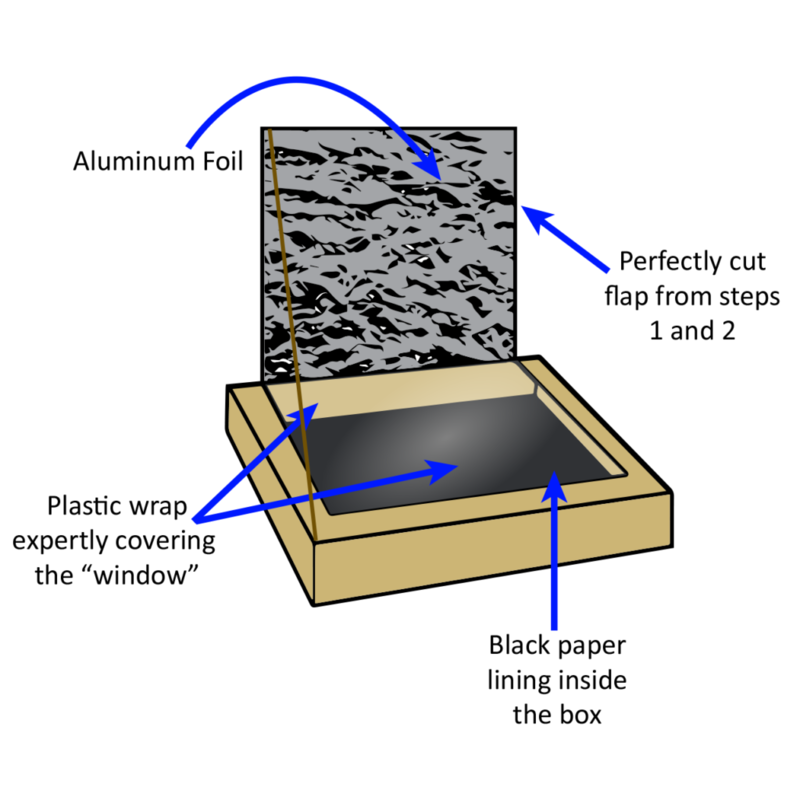 The solar oven in this activity is a relatively simple one made out of a pizza box, aluminum foil, plastic wrap and a sheet of black paper. The aluminum foil in this oven reflects sunlight into the box. The plastic “window” works like a greenhouse roof, allowing (direct and reflected) sunlight to pass into the box, while also retaining heat. At the bottom of the box, the black paper acts as a heat sink that absorbs direct and reflected sunlight to warm it, which heats food placed on top of it.